A hot grill with a cloud of billowing smoke might be the most iconic image of a cooking steak, but your grill isn't always the best tool for the job. For example, steaks cut from the beef tenderloin -- variously known as beef fillet, tenderloin medallions or, most famously, filet mignon -- benefit from the more even heat you can create by cooking them indoors, in your oven. Steaks cut from the tenderloin muscle are all very similar in their cooking characteristics. 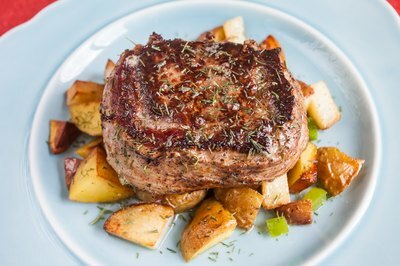 The name filet mignon is traditionally given only to medallions cut from the smaller, tapered ends of the tenderloin, though retailers often apply it to any tenderloin steak. The muscle is very lean, without the fat that lends flavor and slows cooking in other premium steaks. Cooks often wrap filets in bacon to make up for that deficiency. You might amp up its flavor instead with a crust of crushed peppercorns or other spices, or complement its mildness by tying a few sprigs of fresh herbs to the medallions. Season filets at least 45 minutes ahead of time so salt has time to absorb into the meat before cooking. Despite the broiler's intensity, filet mignon cooks so quickly it won't always develop a flavorful, browned crust. Searing the filet first is one way to counter this. Blot the filets dry with paper towel -- moisture interferes with browning -- and preheat a heavy, oven-proof skillet over a medium-high burner. Adjust your oven rack so your pan will sit 4 inches from the broiler, and then preheat the broiler as well. Oil the filets lightly and brown them in your skillet for 2 to 3 minutes per side. Transfer them to your broiler pan, or simply slide the skillet onto the rack. If you want medium-rare filets, they need an additional 3 to 4 minutes per side, depending on their thickness. 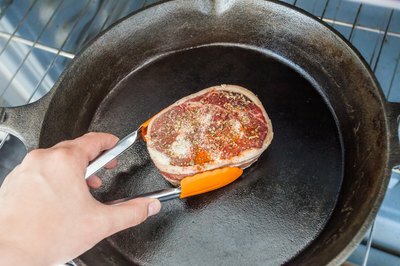 For a simplified version of this technique, slide your heatproof skillet under the broiler and preheat it for 20 minutes while you prepare the filet mignon. Use a heavy pad to slide the rack out of the oven, and carefully position your filets in the pan with a pair of tongs. Broil the filets for 4 to 6 minutes per side, until they reach medium-rare. The blast of heat when you open the oven door can be dangerous, so be sure to keep your face away from the opening. Broiling can also create clouds of smoke, just like grilling. Open a window if you can, and turn your range hood's fan to High. 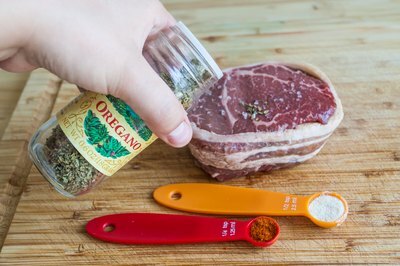 Bringing a thick-cut filet to room temperature before cooking is recommended in many recipes, but is impractical for home cooks for food safety reasons. Finishing the filet with a pat of butter to add flavor and richness is a more useful tip. If you opt to broil in your skillet, as opposed to the broiler pan or an oven-safe ceramic dish, you'll also have the option of making a classic pan sauce. Set the filets aside under a loose covering of foil to rest for 5 to 10 minutes, and return the hot skillet to your stovetop. 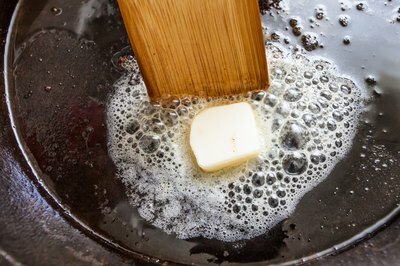 Add a splash of wine or broth to the pan and stir it to dissolve the browned-on beef juices, and then reduce the liquid until it thickens slightly. Finish it by swirling in a pat of cold butter, and spoon it over the tenderloins.